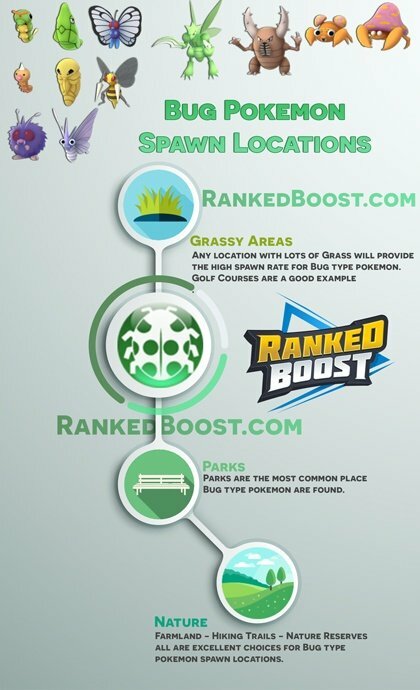 Welcome to our in-depth guide for Catching Pokemon Go Pokemon, Gen 4 Spawn Locations, Climates and Areas all play major factors in certain Pokemon spawn rates. For example bodies of water such as rivers and ponds have a very high spawn rates for Water Type Pokemon. Catching Pokemon Go Gen 4 Ghost Pokemon is easier at night time since Ghost Type Spawn Rate in slightly higher during night time & early morning. Alright, Let’s jump right into these “Biome” Pokemon Spawn Locations. Meaning YES they work together and you will see more pokemon spawning with both in use at the same time. Vaporeon Evolving Eevee into Vaporeon is another great way to get your hands on a strong water type Pokemon. It's even easier using the Eevee Evolution Name Easter Egg. Eggs If you just can't seem to find any water type Pokemon where you live, Hatching Eggs can be another way to obtain some water type. Parks Your Local Park may Spawn Water Type if it hosts a Unquie water Feature. Parks With Water Features such as Water Fountains or Small Ponds. Click/Tap The Names To Learn More About Each One. Moltres, Entei, and Ho-Oh are what is known as a Legendary Pokemon. Flareon Evolving Eevee into Flareon is not a bad option if you are in need of a strong Fire Type Pokemon. Flareon is one of the strongest Fire Type in Pokemon, and can be easily obtained using the Eevee Evolution Name Easter Egg. Beaches Surprisingly, Beaches and coastal areas spawn Fire Type. 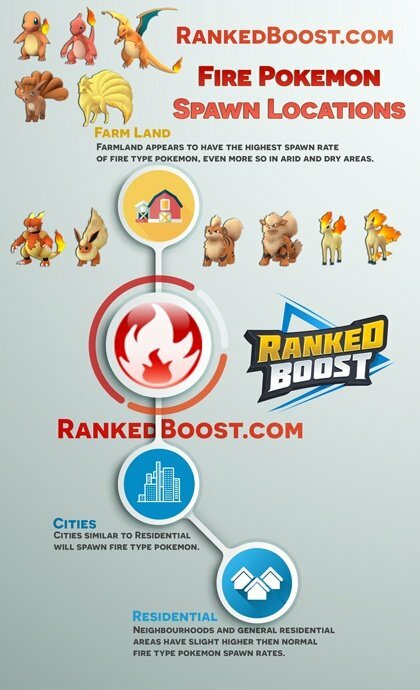 This is possibly due to the climate since this is a factor which determines Fire Type Spawn Locations. Parks Grass Pokemon appear to be the most abundant in parks, you can also find many in large grassy areas. 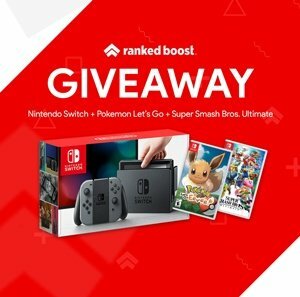 Zapdos, Raikou Are also Legendary Pokemon who do not currently appear in the wild. Jolteon Evolving Eevee into Jolton is the least favorable of the Eevee evolutions. It does, however, make for a great Electric Type Pokemon. Makes sure you use the Eevee Evolution Name Easter Egg. Railway Railways are listed as a spawn location biome, with that in mind the ideal location would be Railway Station where passengers can board and alight from trains. Shopping Commercial (Shopping Districts) such as Shopping Malls have some of the best Electric Type Pokemon GO Spawn Rates. Parking Lots Aside from the obvious Locations like Rock Quarries, there are some not so obvious places players can find High Rock Type Spawn Rates. Parking Lots, the bigger the better in this case. 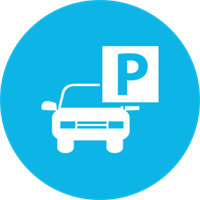 "Parking Buildings" are an ideal spot in terms of Parking Spawns. Mewtwo, Mew, Lugia, and Celebi do not appear in the wild, they will most likely be used in a Legendary Pokemon special event held at a later date. 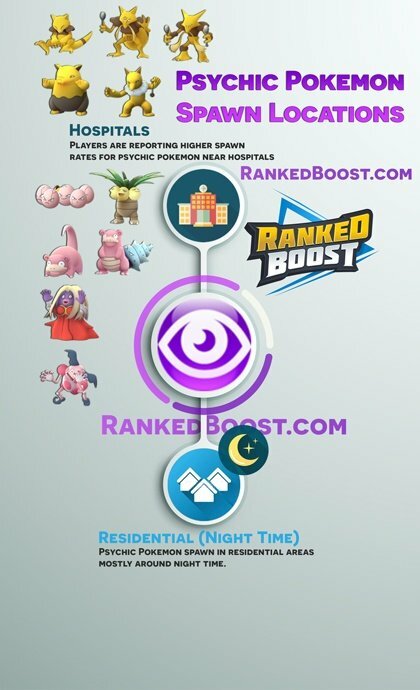 Night-Time It would appear the Psychic Type have a slightly higher spawn rate during Night-Time & Early Morning in Residential Areas. 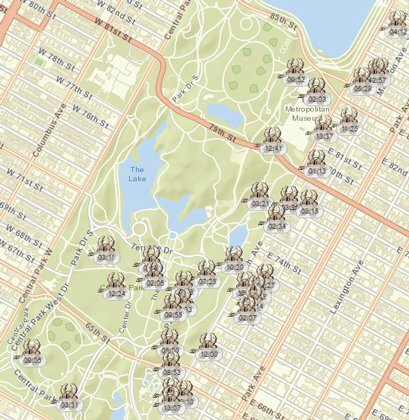 Parks Parks are the best place to look for bug type Pokemon, You will find plenty of bug Type in these areas. Parking Lots Similar to Rock Type, Ground Type share a lot of the same High Rock Type Spawn Rates. Parking Lots are the most ideal, second to that would be Farmlands & Quarries. Shared Type Almost all Poison Pokemon share another Type. That means Grass Pokemon like Bellsprout and Oddish who are also poison type can be found in parks easily due to their shared grass type. Where Do I Catch Normal Pokemon In Pokemon Go: Normal Pokemon spawn just about everywhere they are not hard to find. Some locations normal Pokemon will spawn more often than others. Eggs The majority of rare normal type Pokemon will be easily found within eggs that you hatch. 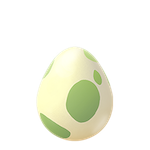 They will also tend to have a much higher IV rating (Individual Values) when hatched from eggs. Dragonite How To Get A Dragonite: Find a water spawn location, preferably one that is able to spawn Dratini. Farming enough Dratini is one way to obtain Dragonite, the other is to hope one will spawn near you some day. Where Do I Catch Fairy Pokemon In Pokemon Go: Fairy Pokemon spawn near landmarks or places of interest. Players are reporting they can also be found near churches and Golf Courses. Golf Course It Appears that Fairy Pokemon favors golf courses, however, players should avoid trespassing in these areas without permission. Recreation Fighting Pokemon appear to spawn more in areas with recreation. This can range from Basketball Courts to Football Fields, even parks are seen as areas of recreation. Night-Time Ghost Type has a slightly higher Spawn Rate during Night-Time & Early Morning.That's not to say you can find Ghost Type during the day, there just bit easier to find during Night-Time & Early Morning. Articuno is a Legendary Pokemon not found in the wild. 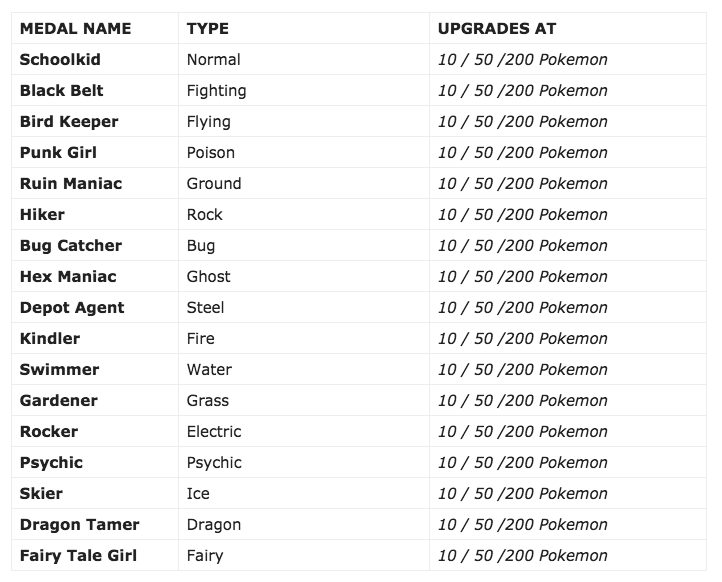 Legendary Pokemon will most likely only be obtained in special events at a later date. Eggs It's possible to obtain every Ice Type Pokemon threw eggs. Most importantly you can get one of the strongest Ice Type Pokemon, Lapras. Where Do I Catch Dark Pokemon In Pokemon Go: Still to be determined. 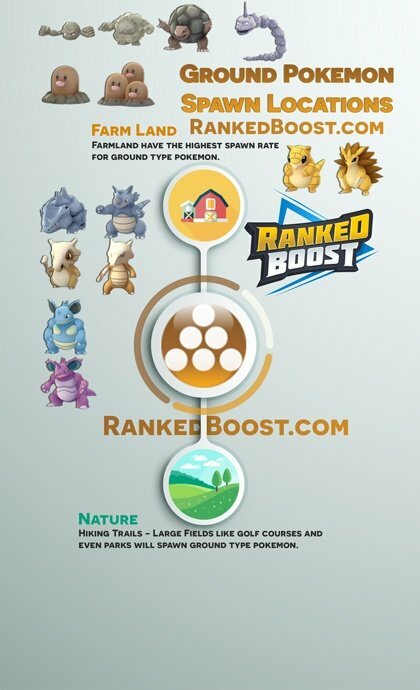 In Niantic newest Unreleased update you will earn a capture rate bonus, increasing your chance of catching rare pokemon. 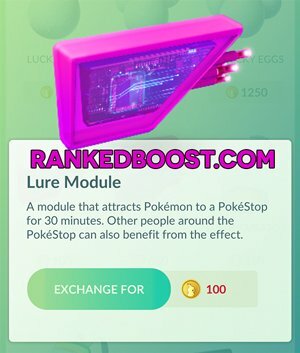 How to capture pokemon with these new capture rate bonuses will give you a higher chance of capturing rare Pokémon with the same related type. 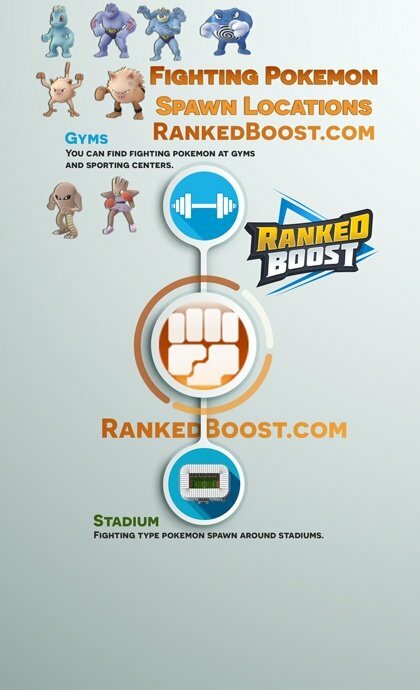 For example, as you reach a higher tier for the Punk Girl Medal, your bonus to catch Poison-type Pokémon such as Koffing, Bulbasaur and Oddish increases. The Basic Pokemon Go Catching Pokemon Tips Players Need To Know! What Is Pokemon Go Nest? Like the name indicates Pokemon Go Nests are locations where a Specific Pokemon has a high spawn rate. At the current moment, there are no Pokemon Go Legendary Pokemon available. Niantic will likely enable players to catch Legendary Pokemon in the future as the game continues to grow. Some Pokémon appear more often in the wild in specific continents or at least have a higher spawn rate is specific locations. 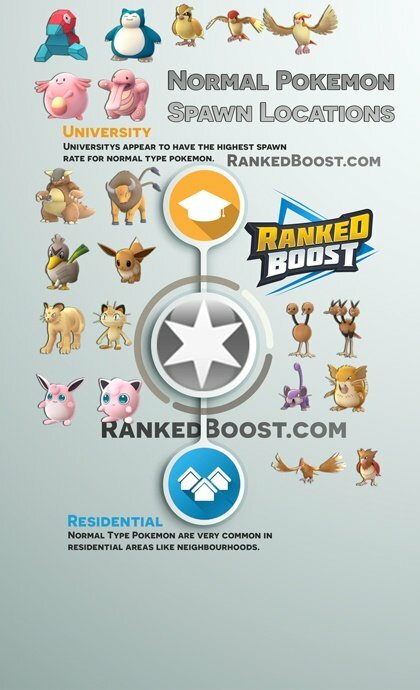 View The Best Pokemon Go Pokemon and see which ones gain the most CP Power Per Level! 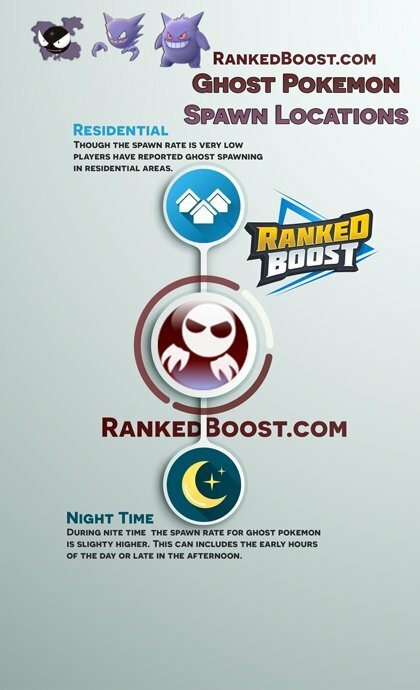 Aside from spawn zones, there is speculation that other factors such as the time of day, the weather (especially humidity), and more can affect Pokémon spawn rates. 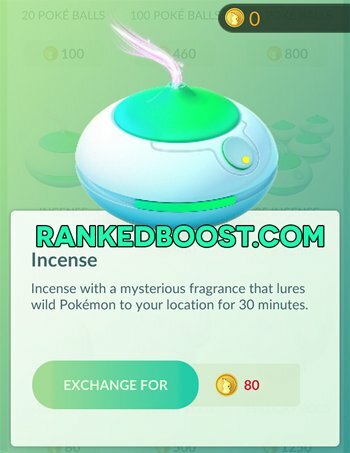 Where Can I Catch Certain Pokemon in Pokemon Go? Based on Players Pokemon Go Catch Locations. Certain Pokemon can be caught in specific locations and climates since these are the two major factors for Pokemon spawn rates. 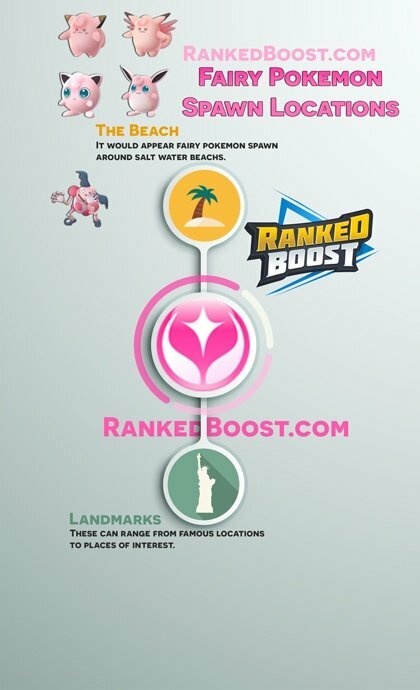 Below We List How To Catch Pokemon In Pokemon Go and their Likey Locations Pokemon will be found. Pokémon Go Normal Pokemon You can find normal type Pokémon in parking lots, cities, university campuses, and gas stations, and near suburbs, grass, lakes, and parks. For the most part. this type will spawn anywhere in any climate. Pokémon Go Poison Pokemon These two Pokémon types are most often found near grass, lakes, and cities, parks and usually in "grassland" or "coastal" climates. 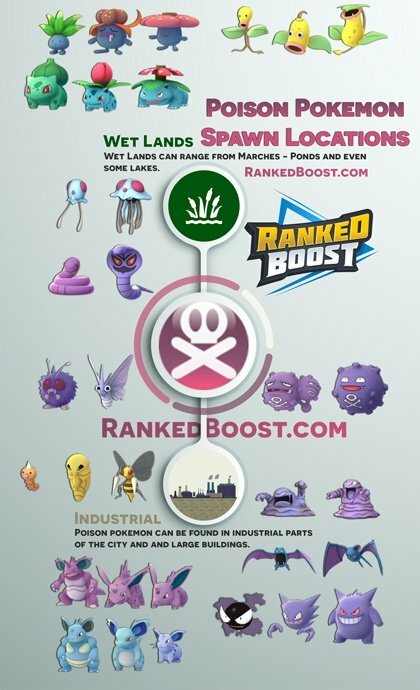 Pokémon Go Bug Pokemon Industrial Areas have a higher spawn rate of Poison Pokemon. 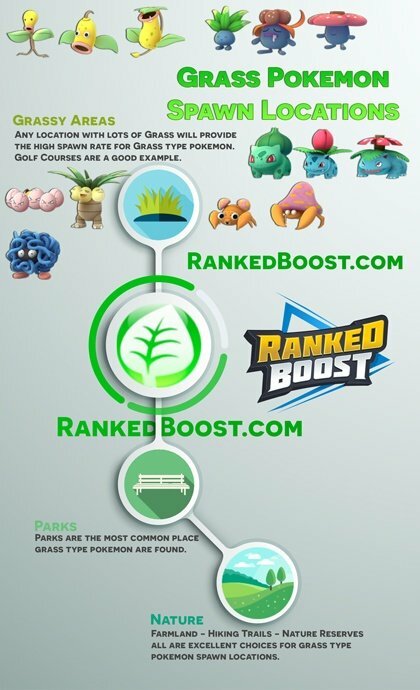 Pokémon Go Grass Pokemon Grass types like to hang out predominantly (surprise) where there is grass: That means places like golf courses and parks, but also near beaches. They're available in all climates, but most predominant in grassland areas. 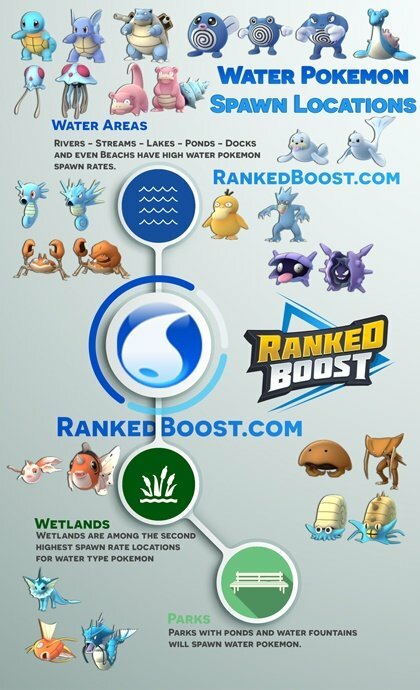 Pokémon Go Water Pokemon Where you will most likely to encounter Water type Pokémon is on the coastline. You can also find them near rivers, lakes, ponds, docks, wetlands, beaches and even parks with ponds or with bodies of water. Pokémon Go Ground Pokemon These desert-friendly Pokémon are pretty common in arid climates, but you may also find them lurking around the suburbs, in parks. Pokémon Go Fire Pokemon Fire Type Pokémon are pretty common in arid climates, Pokemon go players have find fire pokemon strangely, even occasionally at the beach. Pokémon Go Fighting Pokemon There is not enough evidence to say definitively, though these type will spawn almost anywhere in the suburbs and near parking lots. 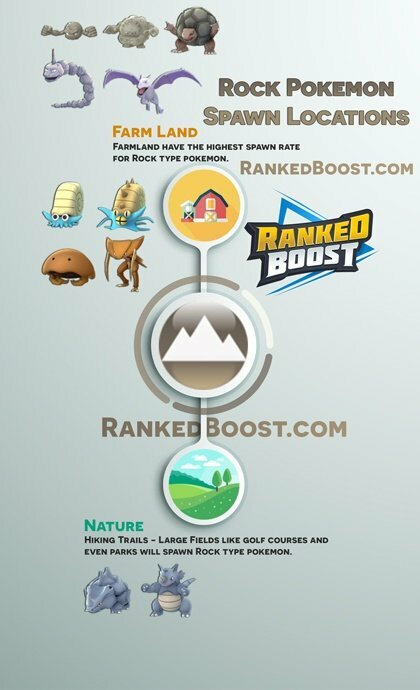 Pokémon Go Rock Pokemon The most likey place you will find rock type is Farmland areas. They can also be found largely in West-coast areas as well as suburbs and parking lots. Pokémon Go Fairy Pokemon Largely found in the suburbs of grassland communities as well as beach towns. Unconfirmed, but this type seems to spawn more frequently in the evening. 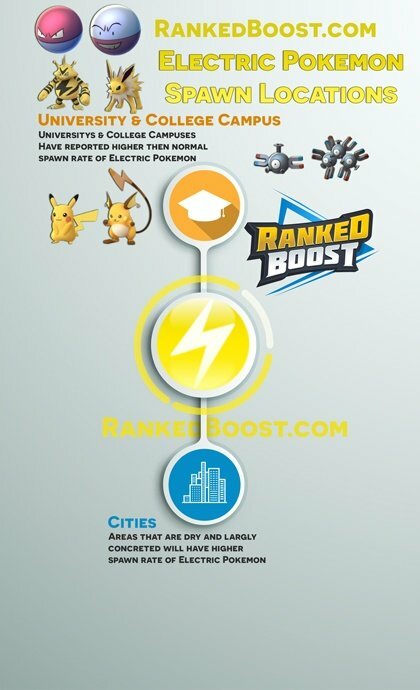 Pokémon Go Electric Pokemon If you're looking for electric type pokemon; you can poke around your local college campus or Universtiy since they have higher spawn rates around those areas. Pokémon Go Psychic Pokemon Psychic type Pokémon love grassland areas, and are some of the first higher-level creatures you can catch in those towns. You can also find higher-level Psychics near the beach. Pokémon Go Ghost Pokemon There is NO evidence to suggest that ghost type spawn more frequently at cemeteries, but they do seem to like parking lots and have a much higher spawn rate at Night-Time. Pokémon Go Dragon Pokemon Dragon Pokémon types are fairly rare, they have been spotted near river water. 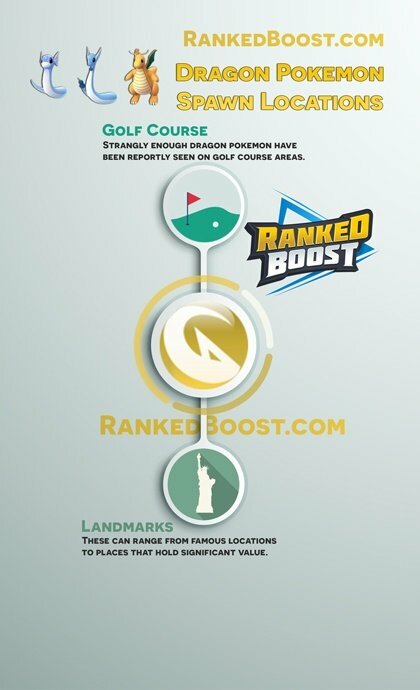 Dragon Pokemon Type tends to have a higher spawn rate near golf courses. 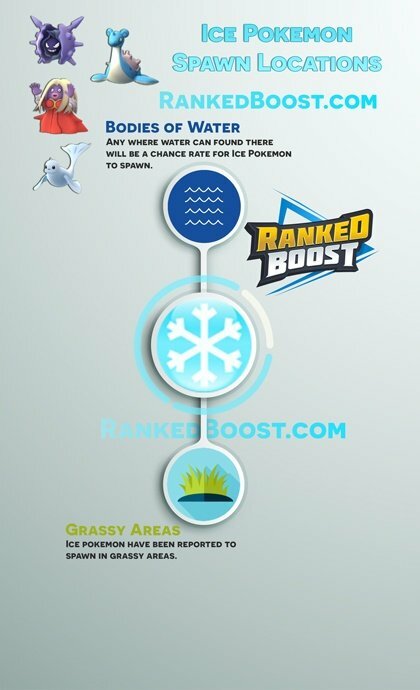 Pokémon Go Ice Pokemon Ice Pokemon are mainly found near bodies of water, however, if your lucky enough to live in a very cold climate your spawn rate for ice Pokemon should be higher. Ski resorts are excellent choices. List of Every Pokemon in Pokemon Go. NORMAL POKEMON Pidgey, Pidgeotto, Pidgeot, Rattata, Raticate, Spearow, Fearow, Jigglypuff, Wigglytuff, Meowth, Persian, Farfetch’d, Doduo, Dodrio, Lickitung, Chansey, Kangaskhan, Tauros, Ditto, Eevee, Porygon, Snorlax. BUG POKEMON Caterpie, Metapod, Butterfree, Weedle, Kakuna, Beedrill, Paras, Parasect, Venonat, Venomoth, Scyther, Pinsir. POISON POKEMON Bulbasaur, Ivysaur, Venusaur, Oddish, Gloom, Vileplume, Weedle, Kakuna, Beedrill, Venonat, Venomoth, Bellsprout, Weepinbel, Victreebel, Ekans, Arbok, Nidoran (Female), Nidoran (Male), Nidorina, Nidoqueen, Nidorino, Nidoking, Zubat, Golbat, Grimer, Muk, Koffing, Weezing, Tentacool, Tentacruel, Gastly, Haunter, Gengar. GRASS POKEMON Bulbasaur, Ivysaur, Venusaur, Oddish, Gloom, Vileplume, Bellsprout, Weepinbell, Victreebell, Exeggcute, Exeggutor, Tangela, Paras, Parasect. WATER POKEMON Squirtle, Wartortle, Blastoise, Psyduck, Golduck, Poliwag, Poliwhirl, Poliwrath, Tentacool, Tentacruel, Slowpoke, Slowbro, Seel, Dewgong, Shellder, Cloyster, Krabby, Kingler, Horsea, Seadra, Omanyte, Omastar, Kabuto, Kabutops, Goldeen, Seaking, Staryu, Starmie, Magikarp, Gyarados, Lapras, Vaporeon. FIRE POKEMON Charmander, Charmeleon, Charizard, Vulpix, Ninetales, Growlithe, Arcanine, Ponyta, Rapidash, Magmar, Flareon, Moltres. GROUND POKEMON Sandshrew, Sandslash, Diglett, Dugtrio, Geodude, Graveler, Golem, Onyx, Cubone, Marowak, Rhyhorn, Rhydon, Nidoqueen, Nidoking. FIGHTING POKEMON Mankey, Primeape, Machop, Machoke, Machamp, Hitmonlee, Hitmonchan, Poliwrath. ROCK POKEMON Geodude, Graveler, Golem, Onix, Rhyhorn, Rhydon, Omanyte, Omastar, Kabuto, Kabutops, Aerodactyl. FAIRY POKEMON Clefairy, Clefable, Jigglypuff, Wigglytuff, Mr. Mime. ELECTRIC POKEMON Pikachu, Raichu, Magnemite, Magneton, Voltorb, Electrode, Electabuzz, Jolteon, Zapdos. PSYCHIC POKEMON Abra, Kadabra, Alakazam, Drowzee, Hypno, Exeggcute, Exeggutor, Slowpoke, Slowbrow Jynx, Mr. Mime, Mewtwo, Mew. GHOST POKEMON Gastly, Haunter, Gengar. DRAGON POKEMON Dratini, Dragonair, Dragonite. ICE POKEMON Jynx, Dewgong, Cloyster, Lapras. Articuno. DARK POKEMON N/A Currently There Are No Dark Pokemon In Pokemon Go.